I agree with the sentiment since it takes capital first to generate a snowball. After the first 100k, the second one will be easier and so on. Eventually the dividends will be so large that one's monthly contribution is less than the dividends received. By then, financial independence will be in full effect and the snowball effect will continue with exponential liftoff. I believe that even with a large market crash, my monthly contributions (as long as I still have my job) will be able to offset any losses incurred. I view market crashes as an opportunity to accumulate more shares in quality businesses. More shares equates to more dividends. My primary objective is income growth, so the price of my portfolio is secondary. The strongest companies will not decrease dividends during market collapses but increase them, as seen in the 2008-2009 disaster when many dividend aristocrats continued chugging along. My portfolio aims at accumulating shares in stable businesses that are non-cyclical. I do hold cyclical stocks but they are of a lesser percentage. I prefer holding businesses that receive the average person's dollar, no matter the economic condition. There will always be a demand for food, drinks, electricity, health, soap, toothpaste, and toilet paper no matter what recession we are in. I aim to own businesses that can provide services for the basic needs. 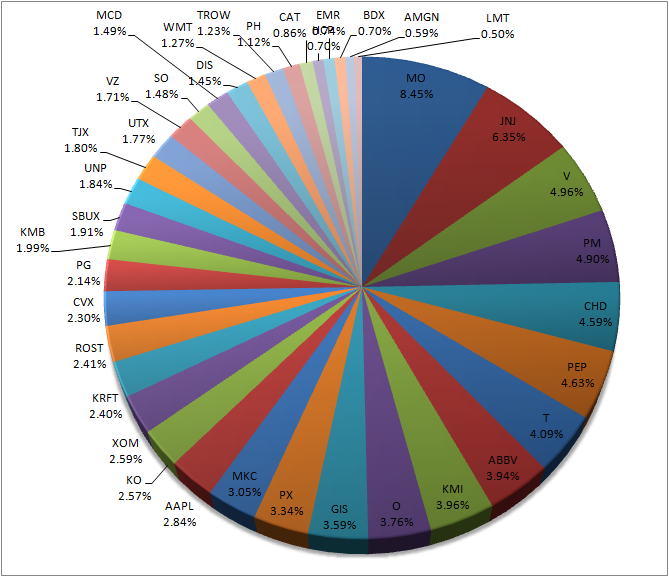 My allocation in healthcare and financials grew last month. I added a lot to ABBV on the lows and also added more to Visa. 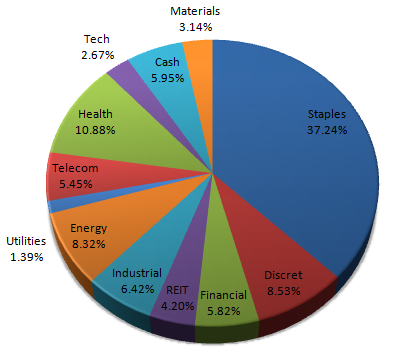 Right now, all the sectors seem relatively even in weighting except for Staples. I plan to keep the Staples sector heavy but would like to increase my REIT, utilities, and industrial exposure more. REITs and utilities will definitely have to wait because of my belief that rising interest rates are going to come, and any increase will send these shares plummeting. Here is a short snippet from JP Morgan on one of the articles in my accounts. 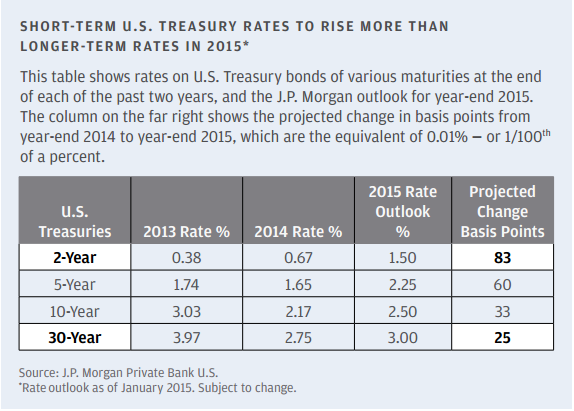 In my opinion, interest rate sensitive investments should be held off until after the hike. It will be prudent to wait and then back the truck up when the securities are beaten up and offer a healthier yield. The picture below shows my stock allocation. I have to work on the heavy weighting on some of my stocks. Their percentage should come down in the coming months as I continue to add more to other securities. I have a lot of teeny tiny starting positions which still have to grow larger. My goal is to try and limit the number of teeny tiny starting positions since it makes it difficult for me to keep up with all the companies. In terms of earnings so far, foreign exchange rates for the US dollar have hurt many of the multinationals in my portfolio. Nothing too surprising except for the beat by Phillip Morris which shot up shares from $75 to $85. Hopefully this cash flow machine will come back down in price so I can add more before the next quarter's dividend. Several companies have missed revenue estimates but overall many have maintained or beat earnings estimates. I am hoping at the moment that multinationals like MMM, CL, KO, and PG will fall lower since I am always looking to add to these quality companies. The PE of a lot of these multinational companies I hold are now higher since their earnings have decreased due to the strong dollar. Very nice summary! I like your charts. Personally, I don't mind having many dividend growth stocks in my portfolio (currently 44 in DivGro), because I feel like "keeping up" only involves knowing that dividends continue to be increased.